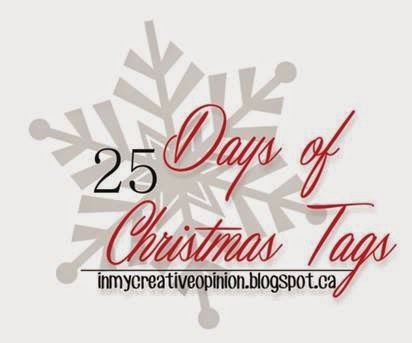 In My Creative Opinion: 25 Days of Christmas Tags start tomorrow! 25 Days of Christmas Tags start tomorrow! Things have been very quiet on my blog over the last couple of weeks. I have been very busy putting together all of the details for the the 4th Annual 25 Days of Christmas Tags! Tomorrow is the big day! If you are familiar with the tradition you already know what to expect, but this year is going to be HUGE! I have an incredible line up of guests that will be joining me as well as some AMAZING prizes. It all happens here tomorrow, the first post goes live at 6:00 am EST. What are you most excited about with this years series? Looking forward to it Tracey!!! Yay! I am excited to create some tags for this challenge, and also to see what you and everyone else does. I can't wait to see what you've created! I'm looking for some tag inspiration this yr. Just spent a pleasant time looking through your previous tags on Pinterest. LOVE! love the tags! great inspiration! 25 Days of Christmas Tags - Day 25!!! 25 Days of Christmas Tags - Day 13 and Your Turn!